Bac Giang (VNA) – The northern province of Bac Giang plans to invest 1.5 trillion VND (66 million USD) to develop high-technology agriculture areas to promote the locality’s strong products such as vegetables, flower, mushroom, tea, lychee, citrus, chicken and pigs. Twenty percent of the investment will be sourced from the State budget, the rest will be mobilised from banks as well as enterprises, organisations and individuals. As many as 35 hi-tech farms will be formed, aiming to raise hi-tech agricultural product value to 30-32 percent of total value of the agriculture sector by 2030. The province also targets up to three enterprises to be recognised as high-tech agricultural firms. 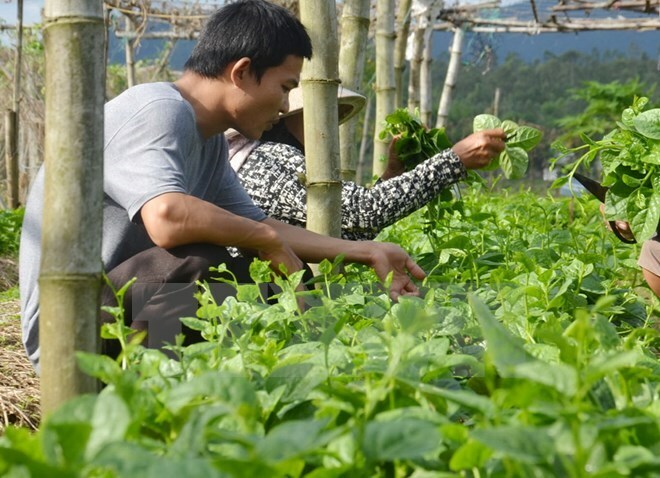 Specifically, the province will establish 17 regions for vegetable farming with a total area of 1,710 hectares in Lang Giang, Luc Nam, Hiep Hoa, Yen Dung and Tan Yen districts, two regions for flower cultivation with 100 hectares in Bac Giang city and Hiep Hoa, and one tea production area covering 300 hectares in Yen The district. Alongside, three lychee regions will be formed with 1,300 hectares in Luc Ngan, Tan Yen and Luc Nam districts, along with two regions for citrus, three for mushroom, two for pig breeding and five for chicken growing. A 100-hectare area will also be developed for the research and application of new agriculture technology, with close relations with agricultural production facilities and businesses. In order to implement the plan, Bac Giang will strengthen communications on high technology, effectiveness of the technology and models of high-tech application, while introducing high-tech farm produces at markets and retail systems. At the same time, the province will strengthen inspection of farm produces’ quality, while creating a favourable legal framework for the development of high-tech agricultural region and supporting the promotion of the products. Bac Giang will also organise training courses on high-tech applications for agriculture, while associating high-tech farms with eco-tourism and calling for the engagement of investors in the field.